The season is upon us! You may have already found yourself in full swing “Holiday Cheer”. Tis the season for twinkling lights, choir cantatas and pageants, work parties, family get-togethers, and let’s not forget the madness in the stores. Sadly, today’s busyness of life makes it quite easy to make it through the entire holiday season without truly stopping to reflect on the reason we are supposed to be celebrating. I have precious childhood memories of Christmas. The kind that leave you with warm, fuzzy feelings, longing to curl up in front of the fireplace with a warm cup of cocoa and watch the snow with the ones you love. I remember my father reading the Christmas passage out of our large white family Bible that always sat on our coffee table. Of course, Christmas Eve as a child was always the longest night of the entire year, and Christmas morning was the only day we were all up before the roosters. While the gift giving was a large part of my Christmas then, celebrating with my church family seemed as equally important. One of the main memories I have celebrating Christmas with them are the night services with the candles burning in the windows and the bright spotlight on the choir as they sang in their beautiful robes. As I grew, the stresses of life slowly took the joy and meaning out of the most wonderful time of the year. School exams soon robbed December of the innocence it once had during the holidays. Instead of enjoying family get-togethers, I was often found at home, studying. Growing up, my parents always made a special cookie recipe that took hours to make, but no one objected because we were together, making memories. Gradually, the joy of Christmas was stolen and replaced with a large to-do list. Today, I am a mother of two young children who still very much love Christmas. When they were younger, we made all kinds of Christmas ornaments and mounds of candy to give away. They loved it. They ask to do it each year, over and over again. But, I must shamefully admit we have not done that in the past two years because I could not find the time. I have slowly watched the joy dwindle from their eyes as the busy schedules of the holidays take over year after year. Recitals, choir and play practices, Christmas parties (with all the families), church gatherings… it all has to strategically be penned on the calendar or the madness may all unravel. Then I stress the rest of the month, praying that no one gets sick because “we don’t have time for that.” Where is the joy in the holiday season? How is that honoring Christ’s birth? This year, through much prayer and reading, I am committed to simplifying Christmas in order to remember and honor the true reason we celebrate. 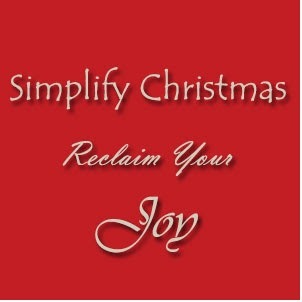 Below are a few ways I felt impressed to simplify and have a more purposeful Christmas. Put Christ in the center of the holiday season. Most have heard the saying, “Jesus is the reason for the Season” or “Keep Christ in Christmas” but sadly, many find it difficult to actually know how to keep Christ in the center of this season. This simply begins by walking with Him daily and allowing the characteristics of Christ to shine through your actions. I urge you to spend time in prayer over how the Lord would have you spend this holiday season celebrating the birth of His Son. Perhaps the Lord will lead you to show love to the family who is spending their first Christmas without a loved one. Or send a care package to a missionary who might need to be reminded that they have not been forgotten. This year, you may even try giving God a gift. Perhaps you need to ask someone to forgive you, or the Lord has asked you to give something up so your relationship with Him may grow more abundantly. Your gift could simply be to commit to spending time with Him daily. Once you purposefully have Christ in the center of your holidays, the rest of your plans will calmly fall into place. Joy will once again be restored to your celebrations! Stop long enough to make those lasting memories. To simplify, slowing down is required. Without investing time, a desirable goal cannot be obtained. Quality time together is vital to the health of your family. Skip the work Christmas party this one year, put the kids in the car, grab a thermos of hot chocolate, and drive around looking at Christmas lights. Turn off the cell phone and watch the excitement in their eyes. Maybe you should forget about the Christmas shopping and make your family’s favorite holiday treat together. Take time to laugh and catch the snowflakes on your tongue. Stop long enough to examine the individuality of each snowflake that lands on your window pane. Or have a girl’s-night-in with your daughter to just simply listen to her dreams, desires, and fears. If you slow down long enough, you will be able to hear the Lord directing you on how to make the best lasting memories this Christmas. Bless someone in secret. In Acts, the words of Christ are quoted for us, “It is more blessed to give than to receive.” You will find greater blessings this holiday season when you bless someone else. It is much more rewarding when you give in secret, not expecting any recognition of what you have done. Ask the Lord to point your heart to someone special to bless this holiday. May the Lord become so real to you this season of celebration that you will not dread the holiday rush any longer. Let His love and grace shine through your lives in such a way that strangers passing you on the street will ask you about your Joy! Do not stress the details of the season, for God’s plan is perfect.